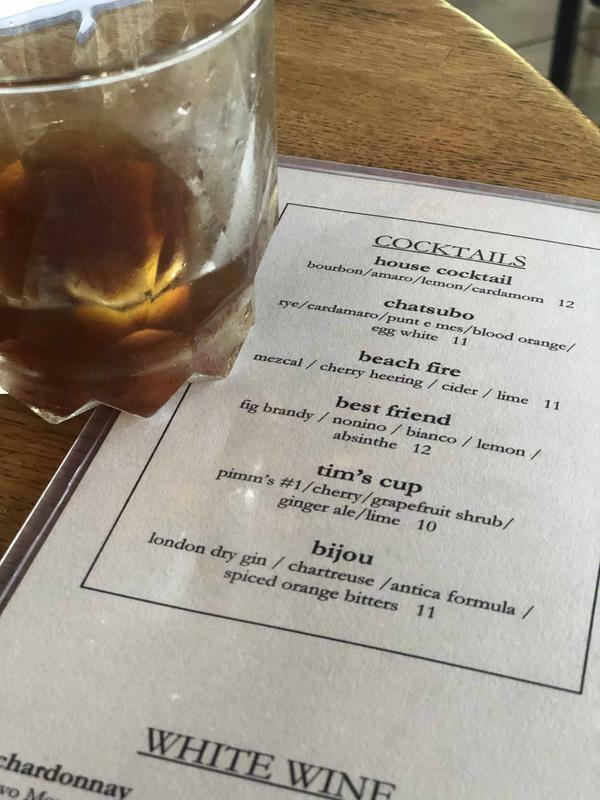 I recently had the pleasure of dining at one of Louisville’s most unique restaurants, The Fat Lamb Modern Kitchen & Bar, located at the corner of Bardstown Road and Grinstead Avenue, in the heart of the eclectic Highlands neighborhood. 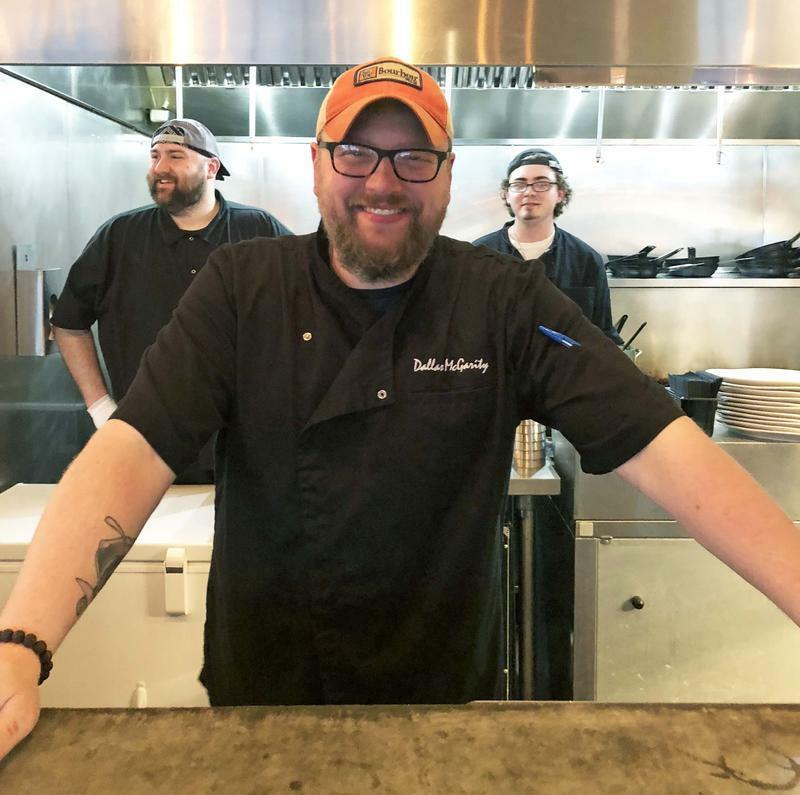 The Fat Lamb is driven by the fearless leadership and culinary talents of Chef Dallas McGarity, who opened the Fat Lamb after several years as chef at the Marketplace Restaurant at Theatre Square downtown. Being familiar with Chef McGarity’s talents, my expectations were high for our upcoming dinner. From the moment we arrived, it was obvious that we were not going to be disappointed. The Fat Lamb dinner menu is simple but features a wide variety of options including vegan, vegetarian and Gluten Free dishes. The overall emphasis is on freshness. Of course, daily specials are rotated and the menu itself is subject to change as Chef deems necessary. This modern kitchen and bar features an American menu accentuated with Greek and Mediterranean influences and the results are incredible. Click Here to View The Fat Lamb Dinner Menu! We started our meal with the simple House Cocktail consisting of Henry McKenna 8 yr old bourbon, amaro, lemon and cardamom. The use of the Henry McKenna bourbon clued us in that the staff here knows their bourbon and that their care in bourbon selection would surely carry over into dinner. 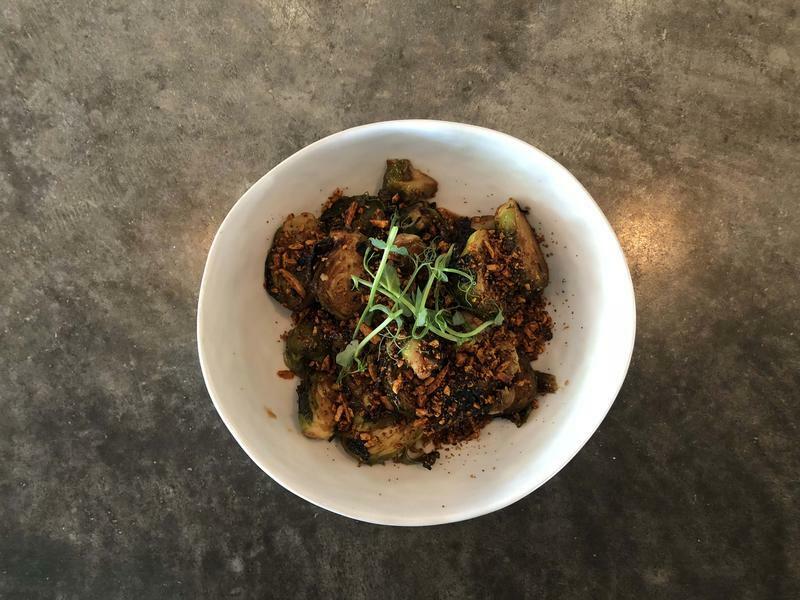 For starters we chose the Roasted Brussels Sprouts with sweet chili lime and smoked paprika almonds, along with the warm bread and sea salt butter. The Brussels Sprouts were highly recommended by our waiter and he was spot on. Just the right amount of heat and the sprouts were cooked to perfection. 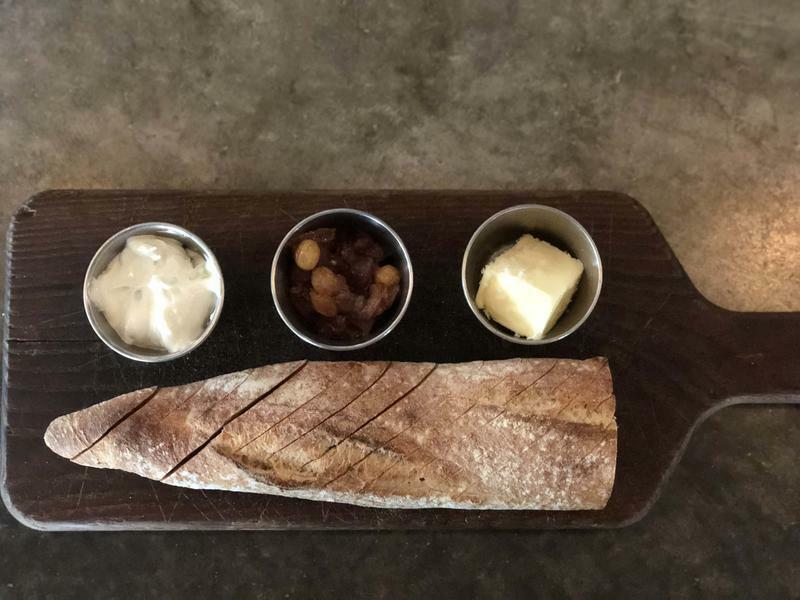 You might not expect to be excited about a bread and butter dish but the sea salt butter was exceptional and when combined with the eggplant caponata and tzatziki sauce it was simply over the top. A great start to an increasingly satisfactory meal! 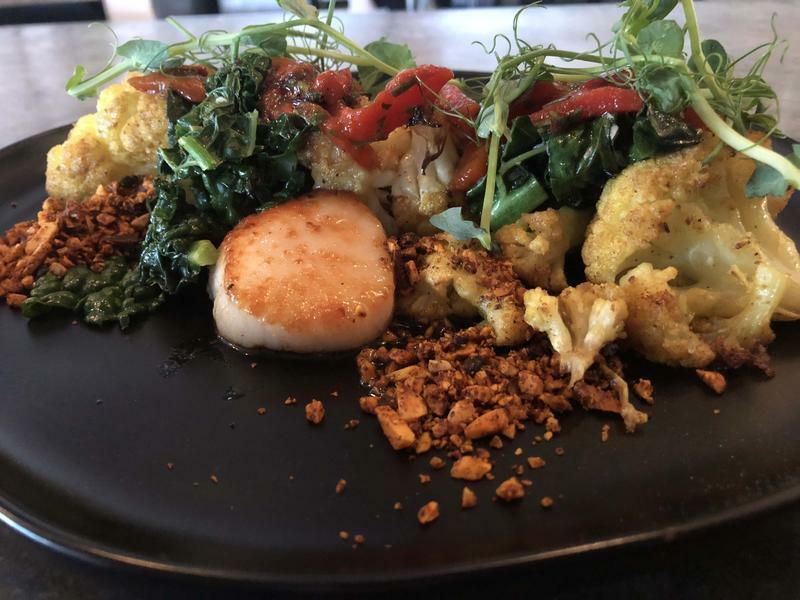 We skipped salads and my partner ended up choosing the Fish of the Day special of Seared Diver Scallops with wilted kale, curry roasted cauliflower, peperonata and house-made champagne vinaigrette topped with smoked roasted almonds. I went vegetarian with the Roasted Red Pepper and Black Bean Fritters. These were accompanied by garam masala-roasted sweet potatoes and broccolini, tzatziki, peperonata and feta cheese. The combination of flavors, textures, colors and every aspect of the meal was obviously done with a lot of thought and care. Although we only got to taste two dishes from the menu it is a safe assumption that any entrée listed would have been a home run and I can assure you this is a place deserving of repeated visits! For dessert, we chose the Salted Caramel Cheesecake, but it was not an easy decision. 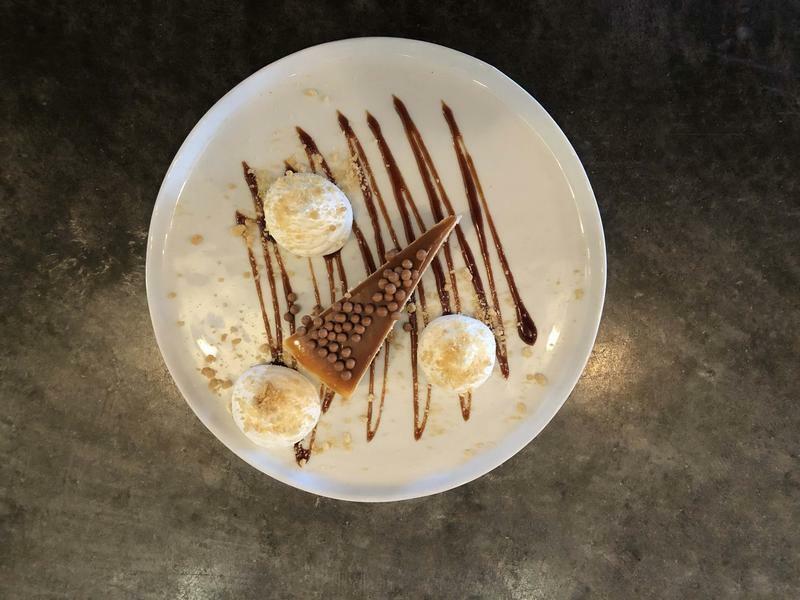 From Canollis, Tahitian vanilla bean ice cream, warm cinnamon butter cake and Nutella mousse, there was something for everyone. By the way, the whipped cream that accompanied the cheesecake was much more than an accent! Our trip to The Fat Lamb was an incredible high note of local dining in Louisville. We’re already excited for the opportunity to go back and try some of the other incredible-sounding dishes we didn’t get to try this time! 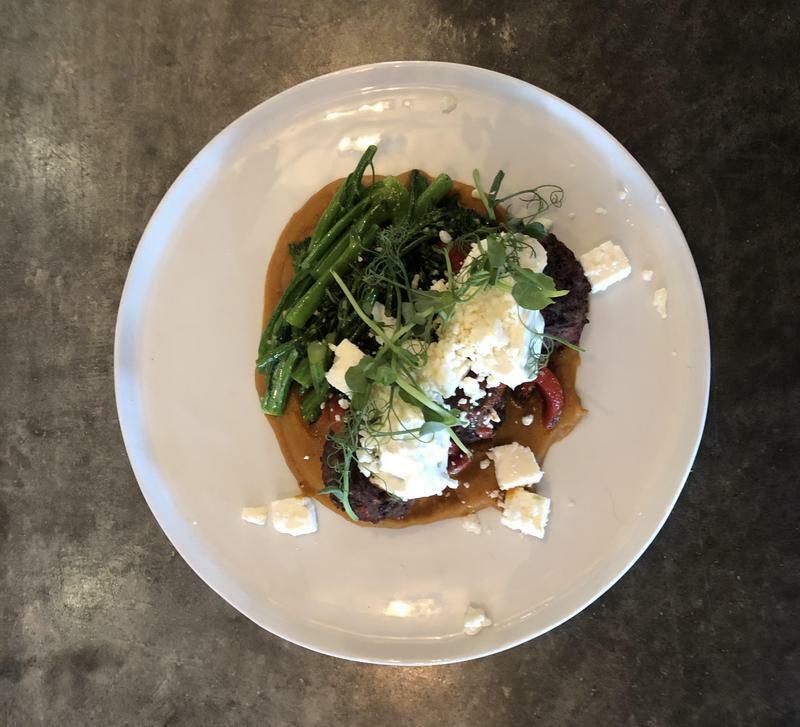 Click Here to Make Reservations and Visit The Fat Lamb Online!